According to federal law, September 17th is Constitution Day – a day that all federally financed educational and governmental institutions must teach about the Constitution. When is the last time “We the People” read the Constitution—all 4400 words? How much do we “citizens” know about its original history, the need for a Bill of Rights, or the impact of the Fourteenth Amendment? And, perhaps most importantly, what is the document’s influence on our daily lives? If you are like most people, the answers are likely disheartening, as is evidenced by embarrassing test results about civic knowledge and a general ignorance that borders on constitutional illiteracy. This constitutional illiteracy, and the apathy it seems to indicate, is odd, because the United States Constitution defines our national identity. In fact, this document’s pride of place in our cultural heritage is part of what makes the country unique: Constitutional values, and not race, ethnicity, or religion bind us together as a nation. We are “Americans” because of a shared belief system, and that belief system begins with those first, inspiring words etched in the Constitution. So how do we make the Constitution relevant to our daily lives? How do we connect to the Constitution? Here are five simple suggestions. Every citizen should read the Constitution at regular intervals. You might even be surprised at what makes it into this original founding document. In addition to addressing the macro issues of structuring the Executive, Legislative, and Judicial Branches, it also provides for the more micro issues like granting Congress the power to coin money, establish post offices, and protect copyrights. The language is, to be sure, old-fashioned, but the choices made in defining the role of the federal government are as relevant today as they were centuries ago. Even more revealing may be how words or clauses have taken on meanings of their own. Many of the most well-known phrases “free exercise [of religion],” “due process of law,” or “cruel and unusual punishments,” exist as fundamental commands without agreed upon understandings. These words have evolved, but to understand and debate their meanings, both conservative “originalists” and progressives who believe in a “living Constitution,” must begin with the text. 2. Remember all that boring stuff like voting? Today, our national voting rate hovers around 50%. Courts have cancelled trials because too few jurors showed up. Citizens are turning their backs on running for elective office. All new citizens swear an oath “to support and defend the Constitution.” That means not only bravely defending its principles from attack, but, more concretely, maintaining the institutions of government from neglect. Citizens must see that the daily, mundane maintenance of the Constitution is just as important as any grander defense of it. Constitutional principles exist on paper. Constitutional rights and responsibilities exist in practice. In every community, in every era, there have been individuals who have witnessed constitutional wrongs and fought for constitutional change. While the Founding Fathers are obvious constitutional heroes, there exist more ordinary and contemporary examples. Individuals like thirteen year old Mary Beth Tinker who went to school with a black armband to protest the Vietnam War (and was promptly kicked out of school setting off a First Amendment challenge). Or Daisy Bates, who defied a history of racism by walking the “Little Rock Nine” students into a segregated school, thus setting off a case that would go to the Supreme Court. In fact, most of the famous cases that end up in the Supreme Court started out with ordinary people, with extra-ordinary problems. 4. Don’t forget to give the Constitution some credit in your daily life. Constitutional principles are built into the fabric of daily life. But, many times we miss seeing their connection to the Constitution. From the eccentric “prophet” shouting in a city park, to town hall meetings, or the publication of your favorite on-line magazine (like the one you are reading), the First Amendment ensures freedom of speech. Personal freedoms from how you educate your children, to birth control, to the security you feel in your homes rest on constitutional principles. The rule of law that structures almost every aspect of our lives – from criminal codes to capital punishment – finds its development and enforcement in the institutions created by the Constitution. The key, of course, is to re-imagine these ordinary parts of our lives as actually connected to our constitutional system. A country built on ideals is only as strong as the next generation that accepts those ideals. Thus, all citizens have an obligation to teach the Constitution. The danger of failing to educate is real. If citizens do not understand why we have three branches of government, or what the judiciary does, or why individual religious freedoms are important, we risk undermining the ability to defend the constitutional system. In 2012, Xavier University’s Center for the Study of the American Dream conducted a survey that found only one in three native-born citizens could pass the civics portion of the naturalization test (a test that requires a 60% pass rate of basic facts about American history and civic structure, and a test that 97.5% of new immigrants pass). These types of surveys may reveal more apathy than ignorance, but speak to a general lack of engagement in constitutional understanding. And, whatever the underlying cause of civic and constitutional illiteracy, in order to continue our long tradition of constitutional ideals, we need to remedy it. Our faith in the American constitutional system is just that – a faith – which requires constant education, ministering, and inspiration. The suggestions above are hardly revolutionary (which is part of the point), but they are fundamental to maintaining a strong constitutional system. The genius of the Constitution was not simply to put American ideals down on paper, but to create mechanisms for citizens to practice those ideals on a daily basis. 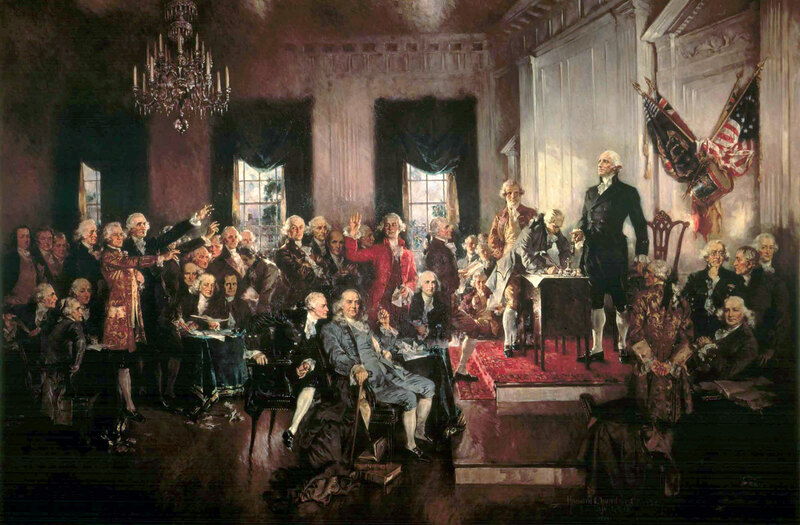 Simply put, every day is supposed to be Constitution Day.